After attending the Fashion Institute of Technology and recognizing that he had a distinctive eye and an impeccable taste for fine bridal jewelry, Barry Verragio founded Verragio in1996. Since then, Verragio has quickly become one of the most sought-after bridal jewelry designer names on the planet. Verragio crafts stunningly beautiful bridal jewelry such as dazzling collections of engagement rings as well as men’s and women’s wedding bands. Artful, mini-masterpieces, Verragio’s rings feature multiple fascinating elements that allow them to stand out from other designers, making his designs both unique and flexible. Elements, many interchangeable, make every Verragio ring as individual as the person wearing it. As an authorized retailer of many exquisite collections of bridal jewelry, Long Jewelers is proud to help meet the demands by offering several wonderful lines from the artisans at Verragio. Long Jewelers carries an extensive selection of Verragio and their friendly and knowledgeable staff is always ready to answer any questions about the selections in their showroom. For one-of-a-kind engagement ring designs and maximum diamond sparkle, shop Verragio engagement rings. 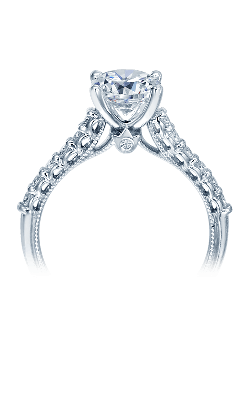 Verragio’s beautiful collection of engagement rings include Parisian, Couture, Venetian, Classic, Insignia, and Paradiso. Also, available today are the many wonderful wedding band designs from Verragio. Couples are encouraged to shop together from the extensive selections of men’s and women’s wedding bands. For women Verragio offers the Parisian, Couture, Classic, Venetian, Insignia, and Eterna collections. Each collection exudes the same sophistication, but each is distinct in its exquisite beauty and gorgeous details. And for men, Verragio’s handsome assortment of men's wedding bands include traditional and contemporary looks sure to please men of all tastes. At Long Jewelers, members of the Hamptons Road community are welcomed every day by an exceptional selection of bridal and fashion jewelry as well as a welcoming, knowledgeable staff. Within the wonderful galleries of Long Jewelers, guests may browse through designers such as A. Jaffe, ArtCarved, Forevermark, Hearts on Fire, Le Vian, Kirk Kara, Martin Flyer, Raymond Weil, Simon G., Tacori, and so many more. While serving Norfolk, Chesapeake, Portsmouth, Suffolk, and greater Hampton Roads, Long Jewelers, located on Virginia Beach Blvd. in Virginia Beach, Virginia is proud to house the latest in bridal and fashion jewelry trends.